In December ADAMI opened the exhibition ‘Being Human’ by artist Maka Batiashvili, a series of ink-on-paper drawings which show the richness of being human. The exhibition is being hosted in the ADAMI office in Tbilisi. Our new initiative for this year, the ADAMI Dialogue forum, is a platform for media professionals to present their projects and create a dialogue with colleagues from the Eastern Partnership countries on how to visualize in media topics related to diversity, integration, and migration. The ADAMI Dialogue seminar in Yerevan (Armenia) on November 4-5 focused on TV and film professionals. Participants pitched and received feedback on in-development films related to cultural diversity to the panel of mentor-experts, including documentary filmmakers Andrzej Klamt (Germany), Irene Langemann (Germany), Vitaly Mansky (Russia/Latvia), journalist Vladimir Vasak (Arte, France), Satik Seyranan (editor-in-chief, 168 Hours, Armenia), and scriptwriter Kote Jandieri (Georgian Public Broadcaster, Georgia). Within the framework of the seminar there was a public screening of the 2016 film RODNYE (CLOSE RELATIONS), by director Vitaly Mansky. Criss-crossing Ukraine and Russia in the years after the revolution, the director shows how the war and new borders in Ukraine has artificially divided families. At the seminar closing, the panel of experts nominated three exceptional projects from Armenia, Moldova, and Ukraine for an ADAMI travel grant to take part in two international pitching events: When East Meets West festival in Trieste, Italy (January 2018), and East Doc Forum in Prague, Czech Republic (March 2018). The first ADAMI Dialogue workshop forum was on October 27-28 in Baku (Azerbaijan) focusing on the new media format of video blogging and larger online media. 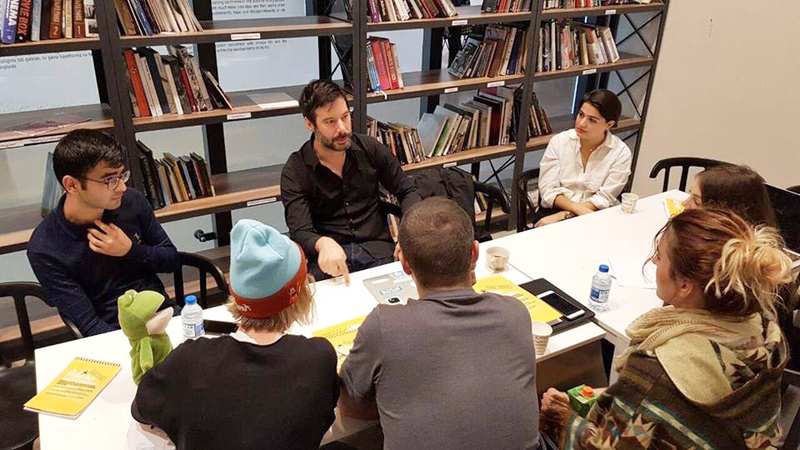 Participants learned about different facets of YouTube and other social media platforms from Gokhan Ekremolgu (on-site consultant, YouTube/Google San Francisco) and Dominique Willieme (Head of Digital Publishing, Arte), as well as the real-life experience of vlogger Magdalena Haase (YouTube vlog considercologne). In cooperation with the Yarat Contemporary Art Space, we held an open public lecture with Dominique Willieme demonstrating TV companies’ innovative approaches in online media. We had the honour to present, for the second time, the ADAMI initiative at the Council of Europe at an official side-event of the parliamentary assembly in Strasbourg (France) on October 10. With parliamentarians coming from across Europe to discuss critical issues affecting Europe and its neighbours, the side-event is a unique opportunity to connect filmmakers from the region directly with decision-makers. We screened three ADAMI prize-winning projects at the Council of Europe. The prize winners were invited to Strasbourg to discuss their films and projects with MPs and special guests and to visit the Arte TV headquarters. In June ADAMI participated in the Deutsche Welle Global Media Forum “Identity and Diversity” in Bonn (Germany) as an official partner. We brought two recent recipients of the ADAMI prize to present before an international audience their winning websites, online videos, and talked about the media situation in their respective countries. In March-April 2017, we sent an ADAMI prize nominee to complete the first ADAMI fellowship/Arte prize, a one-month, funded journalism fellowship with the team of Arte Journal in Strasbourg (France). The first Arte prize was awarded to Georgian journalist Marita Tevzadze, who during her fellowship reported on the French presidential elections for Arte.